Yan Zhenqing’s ancestors came from Linyi (臨沂) in Shandong (山東). During the revolt of Li Xilie (李西烈), Yan Zhenqing was instructed to bring an imperial communique to the rebels. However, he was detained and, on the third day of the eighth lunar month of 785, was executed. Yan therefore has long been considered a loyal martyr of the Tang dynasty. Earlier, in the rebellion of An Lushan (安祿山), Yan Zhenqing’s cousin Yan Gaoqing (顏杲卿) was serving as magistrate of Changshan (常山) in Hebei (河北). When rebel forces invaded the area, the Tang armies did not come to the rescue, resulting in the fall of the town and the death of Yan Gaoqing and his son, Yan Jiming (顏季明). This is what Yan Zhenqing meant when he wrote in this piece, “Traitorous officials did not rescue, so a lone town was surrounded. A father and son perished, and their nest was destroyed. (賊臣不救，孤城圍逼，父陷子死，巢傾卵覆。)” After the incident, Yan Zhenqing sent his elder nephew Quanming (泉明) to the town to make funerary arrangements. However, he could only come up with a few remains of them. 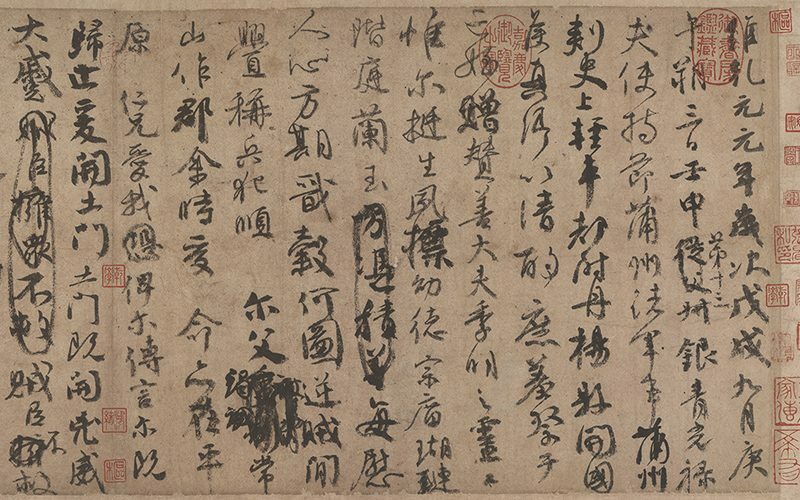 Thus, it was under these circumstances that Yan Zhenqing at the age of 49 wrote “Draft of a Requiem to My Nephew.” Scholars have pointed out that the character of a person is revealed in the way he does calligraphy. Yan Zhenqing was a man of loyalty and integrity all his life, and this spirit is revealed in his calligraphy. This scroll is one of the works most frequently cited by scholars. Done with a stubby brush, Yan imparted a round and upright manner to the strokes. There is considerable variety to the ink tones from start to finish, due to the speed and movement of the brush. This scroll was probably a preliminary draft for a more formal composition. Consequently, Yan Zhenqing went back and crossed out and changed characters in numerous places. This shows how he composed and edited his writing, providing insight into his ideas as well as his calligraphy. Despite the formality of the content, the style of the work reveals considerable emotional unrestraint, making this one of the premier examples from the hand of Yan Zhenqing.